NC Plant Conservation & Beyond: Crater the bay to restore it? Crater the bay to restore it? Carolina Bays are enigmatic, isolated wetlands scattered across parts of the Atlantic Coastal Plain; enigmatic due, in part, to their characteristic northwest-southeast orientation, and ovoid shape, not to mention speculation as to their origin. Whatever their ontogeny, most have been destroyed by ditching, draining, and other land-uses. Many appear only as faint impressions on aerial images. One reasonably intact example of a Carolina Bay is the object of our conservation & restoration efforts in Sampson Co, NC (shown on the image above). This bay persisted amidst a maze of logging roads and uplands managed intensively for timber production, unlike an adjacent example which was repeatedly logged and shows few remnants of its original wetland character. I have no explanation why this particular bay was spared. However, remnant vegetation persists, displaying characteristics of "cypress savanna". 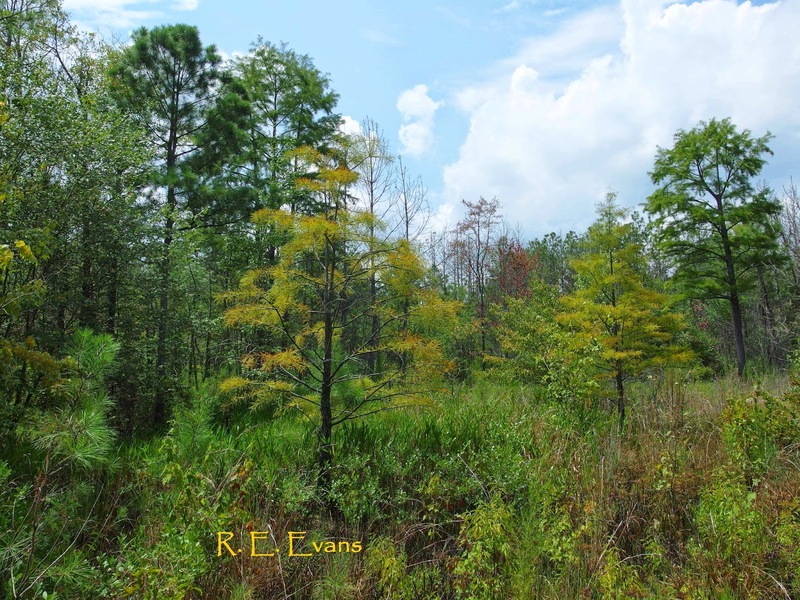 The dominant trees throughout the wetland would likely have been Pond Cypress (Taxodium ascendens). 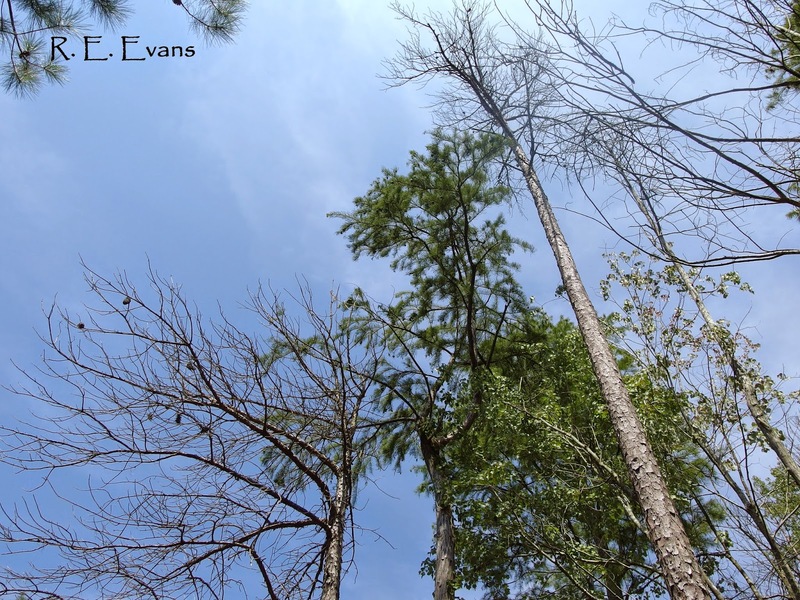 Like the image above, there would have been a relatively open canopy, with few Loblolly pines (Pinus taeda), above a dense, herbaceous dominated ground layer. 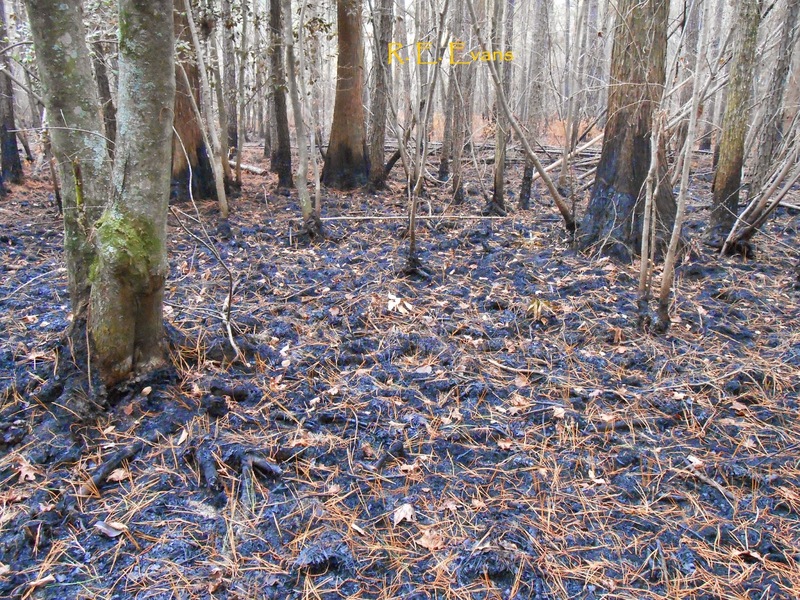 However, most of the bay is now closed canopied and dominated by Loblolly which invaded the wetland due to a combination of periodic droughts and very infrequent fire. 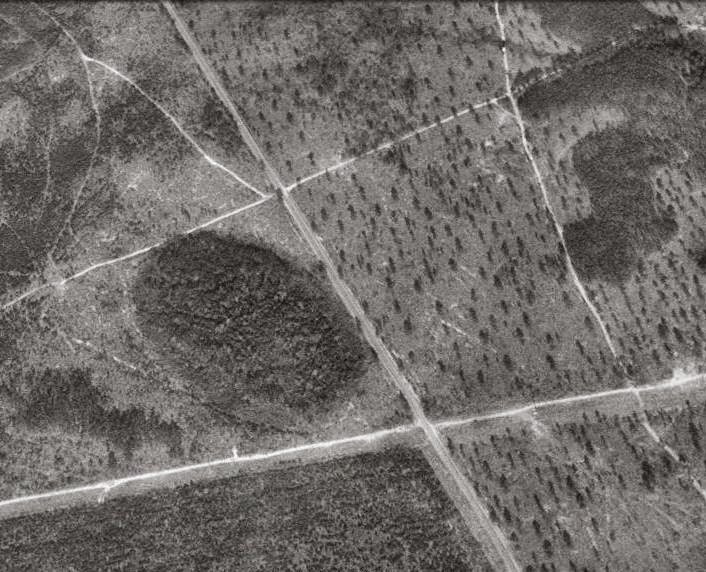 Pines grow alongside cypress (see left), sometimes capitalizing on what appear to be raised mounds created by the Cypress. Because Cypress is both slower growing and more shade intolerant than loblolly, the predictable result is that pines will eventually replace the cypress. They also absorb and transpire more water, drawing down the water table and further increasing their competitive advantage. Therefore, a primary restoration issue is removal of the pines. Given the sensitivity of the site, conventional logging was not an option, and felling individual trees was deemed too labor intensive. After extensive consideration and experimentation, we decided to bring fire back to the bay and implemented a prescribed burn in the middle of November. Fire weather forecasting called for northeast winds @ 9 mph, 55 degrees, 44% humidity. Keetch-Byram drought index (KBDI) was high (over 500), and fuel moisture across all size classes was less than 20%. The fire carried well across the entire site, as expected. Flame lengths stayed generally low although there was significant variation as measured by scorch heights afterwards. Active fire burned out quickly and was easily contained. 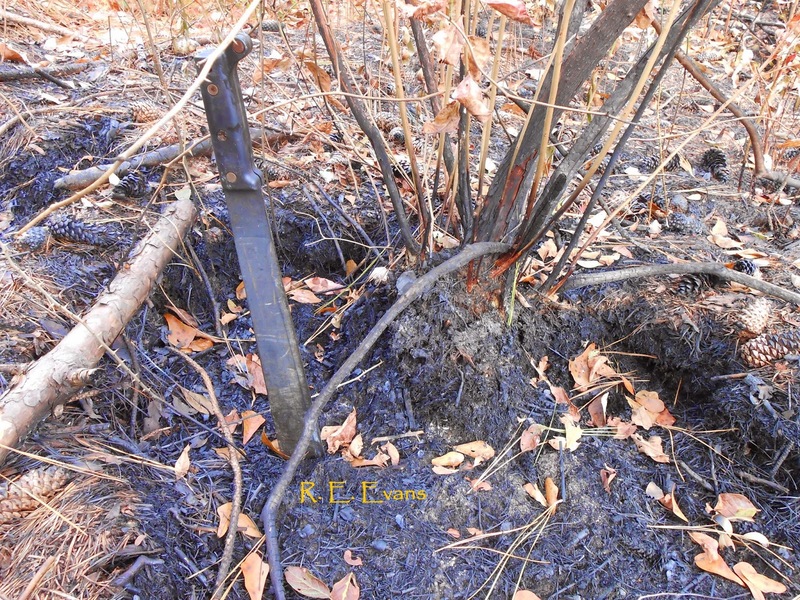 Dry fuel conditions allowed fire to smolder pockets of surface organic buildup consisting mainly of intertwined pine roots. As a result, a number of trees throughout the bay succumbed. A few, like the Red Maple (Acer rubrum) shown above fell over and died immediately, while most trees either survived or died more slowly. The following chart displays the survival of the three most common trees, Loblolly Pine ("Pinus"), Cypress ("Taxodium"), and Maple ("Acer") across 5 diameter size ranges. For a given species the colored lines within each size class show the number of stems before fire ("Pre") and the number surviving after ("Post"). These data show relatively heavy stem losses of Pines (blue lines) across all size classes, while mortality of Cypress (red lines) was concentrated in the two smaller size classes. Taken together, this shows an overall shift away from the strongly pine-dominated vegetation of the Carolina Bay before fire to an equal mixture of pine & cypress after fire. 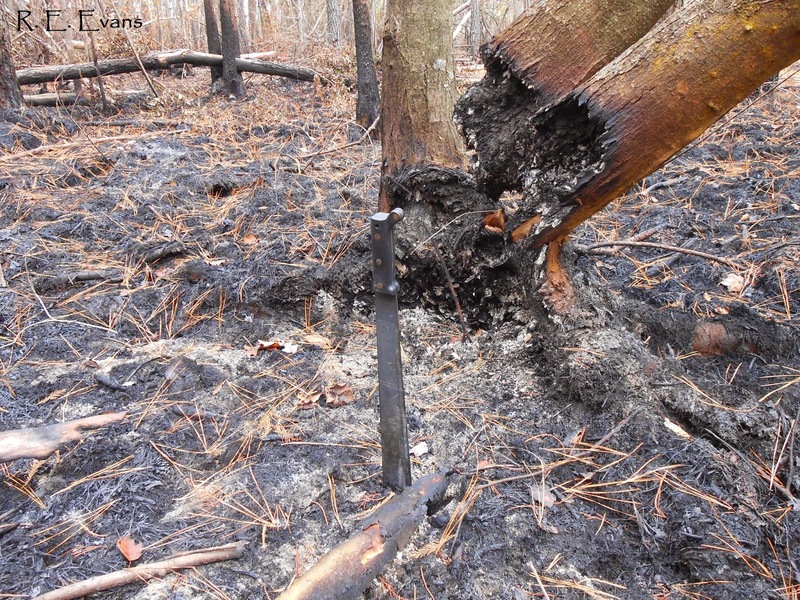 The lone fire was not sufficient to restore cypress savanna but it produced significant progress.